Since a few months back, I was crazy experimenting the beancurd pudding secret formula. I wanted to break the code. After nearly 20 combinations without a good outcome, I decided to give my family and myself a break. It has reached a point that we were tired of eating beancurd pudding. You see, I wanted to do away with Vitasoy that claimed to give a closest comparison with those famous ones. Personally I am not a big fan of Vitasoy as I feel that there is an after taste. I don't consider that a soya milk. Also I have done tests to see whether gelatine (which is common item in my household vs the instant jelly powder) works and it did. To be honest, my first attempt was very close by using gelatine. The aroma of the milk boiling was very close as well. I think decreasing the amount will be perfect but I wanted to experiment more. I wanted to try using instant powder as it was known as the key ingredient, the result was not so favourable but I was determined till we got sick of it. Recently someone from a Facebook group started a heat wave and that got me interested once again. Anyway, I succumbed and decided to buy a packet to taste the difference. The verdict was still not so favourable despite being close though it did set nicely. Somehow the texture is not what I am looking for and as well as the taste. Both hubby and helper said it didn't pass the test. For big fan of the beancurd pudding, I think for the time being, this is okay to whet your appetite and you don't have to pay a ridiculous S$1.50 for a small tub. Warm milk without it boiling. Mixed creamer with instant jelly. Add instant jelly mixture into the warm milk. Stirring constantly till the instant jelly powder melts. Turn off heat and pour into jelly mould. Set aside to cool before chilling in the fridge. Approx 3 hours. Hmmm... I have a recipe in my blog with the name Longan Tofu. 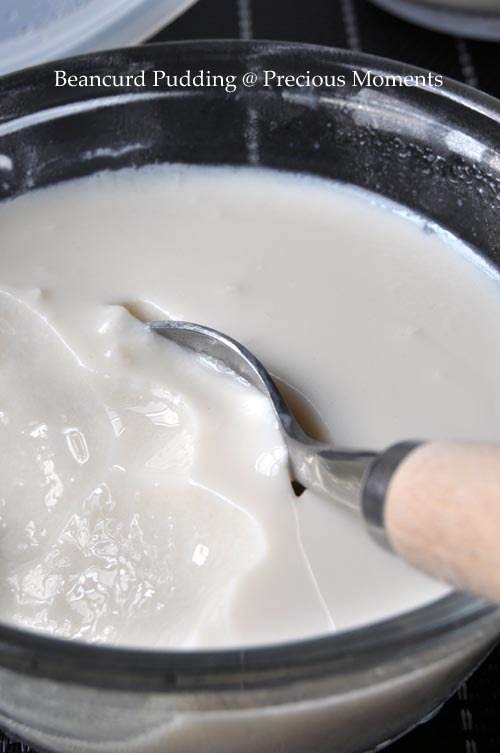 It has evaporated milk in it, therefore taste much richer than jelly made with plain soy milk. Ellena I am still not too happy with this combination. Wendy the component is correct for my test but need to get ratio right. Adding evaporated milk might alter the taste . I used the recipe from Christine's recipe twice, as recent as last weekend and I was successful. You can get it from her blog in Chinese version and in English version. You can add almond extract or vanilla extract to your unsweetened soy milk. I used the recipe from Christine's Recipes blog twice, as recent as last weekend and I was successful. You can get it from her blog in Chinese version and in English version. You can add almond extract or vanilla extract to your unsweetened soy milk. I used Christine's Recipes in her blog. It came out perfect. I did it twice. You can add vanilla extract or almond extract to the unsweetened soy milk. Edith, keep it up and don't you ever give up what you're doing now. I bet you'll get the right one. 'Jia you'.lol! You're almost there...the 'Satifaction' that we're looking forward to. Kudos! Try 'Unisoy' soy milk powder instead. I've made this several times (same recipe), it tastes better than using vitasoy. And I don't like vitasoy too, taste artificial, at least to me. Wendy, I will check that out later. BTW, it is not Logan Tofu that I am looking for. This beancurd pudding is taking Singapore by storm. Alot of copy cats now. It is a cross between Dou Fa and pudding. Hard to describe to you as you got to try it to understand. Thanks Kristy for your encouragement. I hope I can achieve the right texture and taste by this weekend. Just bought more soya milk. hahaha. Blessed Homemaker. Unisoy? Ok later I go and buy. Let's hope it is not a big pkt. So you too don't like Vitasoy. Me too, I am very sensitive to artifical flavouring. konde, no pudding like soft custard and not porridge. Would love to try this but not sure which brand is better. I also feel that Vitasoy taste artificial and I don't like creamer too but I may try who knows I will be tempted by all the chefs in the FB group. 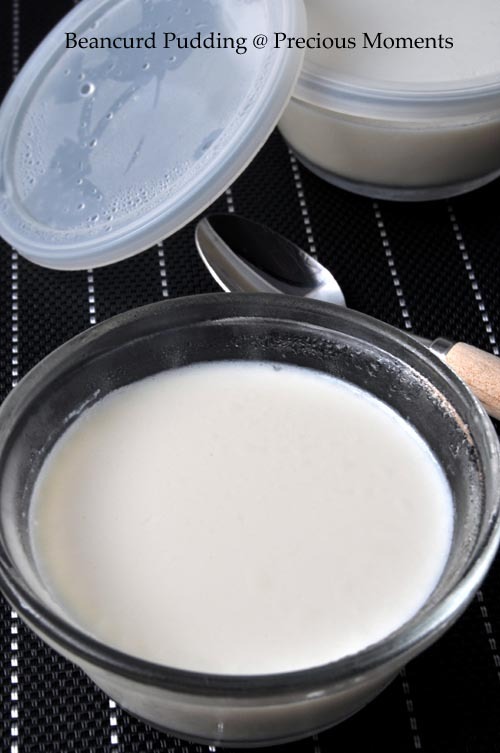 I am going to make my own soya milk tml and make soya milk pudding . Btw there is a recipe in my blog that use 1 litre of soya milk plus one cup of fresh milk and littke agar-agar powder which I think not bad . U may want to check it up. Ann, brand as in the stall brand? There is quite a few new ones sprung out but I still like the ones avail in Old Airport Market. Angel, hahaha you and I shared the same taste bud. I think it is not so much about the soya milk coz the pudding itself has got no strong soya taste. I tried milk and soya combination and also with gelatine and instant jelly. Somehow I can't get that texture right. Will check out your recipe. I don't think it taste like the famous stall at old airport road. But it's a good substitute and I can save some $. So I'm staying with this recipe till I find another better version. I tried that one too n it is not the same at least in my opinion. edith, what is the creamer here? is it something like coffeemate?